Mar. 31, 2018 12:30 p.m. 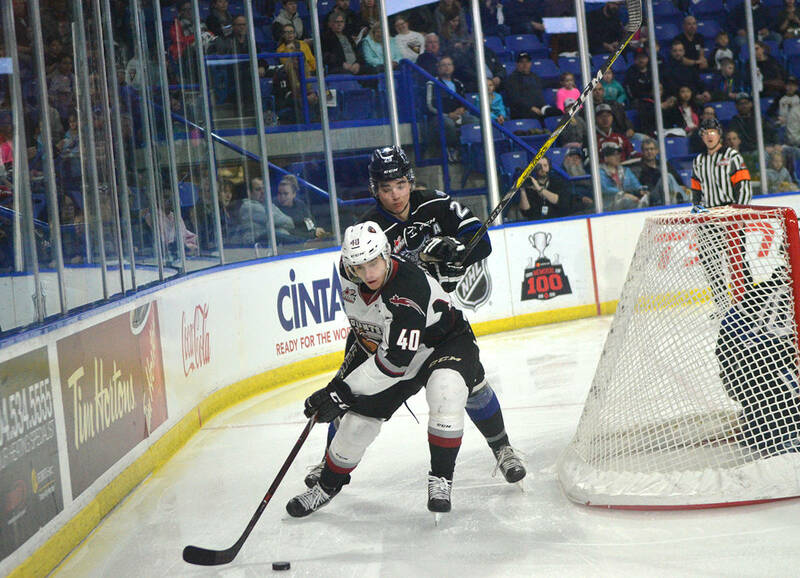 It is down to a best-of-three with home-ice advantage back in the Victoria Royals favour. The Royals’ Tyler Soy made his series debut and put on a line with Matthew Phillips and Dante Hannoun, the trio delivered five goals and a dozen points in a 7-3 win over the Vancouver Giants. But ahead of game five, Giants coach Jason McKee is a firm believer that what happens in one game has no bearing on the next. The Giants should get a boost with the return of two of their top four defencemen, Darian Skeoch and Matt Barberis, who are both eligible to return from suspension. Skeoch was ejected in game one and banned three subsequent games while Barberis was tossed in game three and suspended an additional game. Without the veteran duo, Vancouver had a pair of 17-year-olds and a 16-year-old in their top-four in the game four loss. And while Vancouver gets two key pieces back, the Royals have apparently lost Soy once again. Royals general manager Cameron Hope told Postmedia’s Steve Ewen that Soy will be out for the remainder of the series after suffering an injury during a third-period altercation with the Giants’ Tyler Benson, which resulted in coincidental minors. Through four games, each team has scored 14 goals. The biggest difference has been the manner the goals have come. Victoria has struck for five power-play goals on 21 chances, compared to two on eight opportunities for the Giants. The discrepancy for power-play advantages is even greater if you consider Vancouver has been whistles for a pair of five-minute major penalties. The Royals did take two minutes out of one of those majors with a penalty of their own, but the extra four minutes amounts to two minor penalties, so it becomes 23 minor penalties versus 12, a nearly two-to-one ratio. Five-on-five, the Giants have held the advantage with 12 goals compared to Victoria’s nine. Eleven Giants have scored one goal or more, led by Milos Roman’s three goals. But Benson has just one goal — although he does have a team-best six points — and 61-goal scorer Ty Ronning has yet to find the back of the net. He does share the team lead with Benson with five assists. Only once this season did Ronning go four games without a goal, a stretch in early October where he went 271:20 without a goal. Going back to the regular season, when Ronning scored in his final game, the dynamic winger’s drought is currently at 251:53. McKee said while Ronning may not be scoring, he is doing everything else necessary to help the team. The teams will return to the LEC for game six on Monday afternoon with a 2 p.m. game. If necessary, the teams will play game seven the following night back in Victoria.